Yesterday I mentioned that after discovering the moons of Jupiter, Galileo went on to observe the phases of Venus, which further reinforced the idea that the Earth moved about the Sun. So just how do phases of a planet prove it revolves around the Sun? The phase of any planet or moon depends upon its position relative to the Sun and your position relative to it. This is because planets and moons don’t produce light themselves (at least not much in the visible spectrum), so only the side that is facing the Sun is illuminated. Basically that means that about half of any planet/moon is illuminated at any given time. But this doesn’t mean you always see half of it lit up. A good example of this is seen in the phases of the Moon. The Moon orbits the Earth, and as it does we see different amounts of the Moon illuminated. A full moon occurs when the moon is positioned in the opposite direction of the Sun. With the Earth between the Sun and Moon, we see the fully lit moon, hence it appears full. Because of their orbits, the Sun, Earth and Moon aren’t in a perfectly straight line during most full moons, which is why lunar eclipses don’t happen every month. When the Moon is aligned perpendicular to Earth and Sun, we see half the moon illuminated. These are called quarter moons because they occur at the first or third quarter of the lunar cycle. Quarter moons can be seen either in afternoon and early night (first quarter) or late night and early morning (third quarter). When the Moon is between the Sun and Earth, then the illuminated side is away from us, so we don’t see it. It is known as the new moon. Again, since the Sun, Earth and Moon aren’t usually perfectly aligned, so solar eclipses are rare. With Venus things are a bit different. You can see Galileo’s observations in the figure here. The phases of Venus are compared to the apparent sizes of Saturn, Jupiter and Mars. You’ll notice two interesting things about Venus. First, it has phases ranging from crescent to nearly full. Second, it changes dramatically in size, being large as a crescent and small when nearly full. 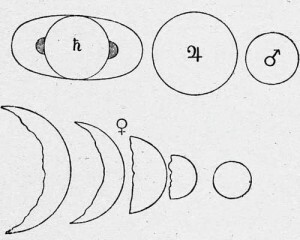 Together these observations demonstrate that Venus orbits the Sun. It was long known that Venus was never seen far from the Sun. It would appear in the morning sky before sunrise, or in the evening sky after sunset, but you’d never see Venus in the middle of the night. In the Earth-centered model it was thought that motion Venus was on an epicycle of a celestial sphere rotating about Earth in sync with the daily motion of the Sun. Since the epicycle of Venus was always aligned with the Sun, Venus never wandered far from the Sun. But this also meant that Venus would always be closer to the Earth than the Sun. If that were the case, then Venus could never appear in a nearly full phase. If Venus is always between the Earth and Sun, then at most we would would only see half of it illuminated. When the Moon is in full phase it is farther from the Sun than Earth. So the fact that Galileo observed a nearly full phase of Venus meant it must have been further from the Earth than the Sun is from Earth. In other words, it must almost be behind the Sun. When Venus is in its crescent phase it must be nearly in front of the Sun, since most of the illuminated side is away from us. This is where the change in size becomes important. Since Venus can be seen both as a crescent and as nearly full, it must sometimes be in front of the Sun and sometimes behind. Now if you still support the Earth-centered model, you could argue that the Sun and Venus both lie on an epicycle, thus rotating about each other, but the epicycle still rotates about the Earth. But if that were the case, then either both the Sun and Venus would appear larger and smaller as they move closer and farther from the Earth. But only Venus changes its apparent size, and it does so exactly as you would expect for a planet orbiting the Sun. So it must be that Venus orbits the Sun, not the Earth. The discovery of moons orbiting Jupiter just reinforces the fact that the Earth-centered model is wrong. You could say the geocentric model was just a phase.